During a bloody 1966 genocide in Nigeria that ended with as many as 50,000 Igbo tribe members murdered, a group of Christian missionaries risked their own lives to save others. 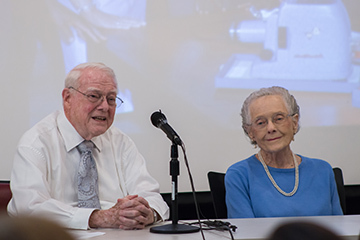 Among them were former Samford University professor Bill Cowley and his wife, Audrey, who were Southern Baptist missionary educators in Jos, Nigeria, at the time. Their daughters, Carol and Karen, were ages 10 and 8. Although they haven’t spoken about it much through the years, the Cowleys and others have recently begun to share their memories of the atrocities. They and other missionaries who assisted the targeted Nigerians are featured in a documentary that chronicles the tribal bloodshed in and around Jos that September of 1966. The Disturbances, produced by the Baptist Center for Ethics, will be shown at Samford during homecoming week at 7 p.m. Thursday, Nov. 10, in Brock Forum. The viewing is sponsored by Samford’s Global Center and Office of Spiritual Life. The Cowleys will attend. Earlier this fall, the couple spoke at Samford about the events that led to their dramatic transport of a van load of Igbos to an airplane and ultimate safety. They were joined in the discussion, hosted by Samford’s Global Center and religion department, by one of the film’s producers, Cliff Vaughn. The Cowleys were assigned to Nigeria in 1955 to help start schools in anticipation of the nation’s independence in 1960. After founding Baptist High School in Jos, located in predominately Muslim northern Nigeria, they quickly grew accustomed to unrest among the many nearby tribes. “We weren’t there to take sides, or we might have been banned, and we wanted to stay a while,” Cowley said. The tensions leading to the 1966 genocide had begun when Igbo tribe members from southern Nigeria migrated to the north in response to jobs created by economic development in the new nation. The Igbo people quickly adapted to western education and training, and rose to the top in the job pool, Cowley said. The northern people, mostly Hausa, became resentful of the sometimes boastful Igbos. When recurring incidents and rumors erupted in genocide in September of 1966, the Cowleys sheltered six Igbo teachers and students in an uninhabited house near their home about a mile from the school’s compound. “There was never any thinking that we would do nothing and leave our teachers and students in danger,” Cowley said. Soon came rumors of plans to evacuate Igbos via airplanes that would shuttle them to safety in other parts of the country. But that meant first secretly transporting them through 10 miles of military and police check points between the school and the airport. Cowley recalls driving a van back and forth through security positions for a week so that the security detail would be acquainted with the vehicle. “We made friends with the soldiers and policemen,” Cowley said. On the day of evacuation, they removed the van’s center seat to hide their extra passengers, and Cowley carefully drove past the inspectors, who received cheerful waves from Karen and Carol through the rear window. “It was the longest day of my life,” Cowley remembers 50 years later. In the front passenger’s seat and throughout the long day, Audrey Cowley used her nervous energy to knit a scarf. “I had to do something with my hands,” recalled the math educator who served as national treasurer of Woman’s Missionary Union when they returned to the states after 23 years in Nigeria. The Cowleys chose not to put their passengers on the first plane that arrived as it was going further north. It was later learned that all the Igbos aboard were killed as they left the plane at its destination. “It was of the Lord that our six did not get on the first plane,” Audrey said. After their six flew out on a second plane, “We didn’t hear anything from them for many months,” Cowley said. A few years later, former student Jonathan Ikerionwu returned to the Jos school and more recently reunited with them at Samford. Ikerionwu, who earned a doctorate in the United States, is now a professor in Nigeria. At the time, and for years later, the genocide was kept very quiet. When the Cowleys retired from the mission field, he began a 16-year tenure (1977–93) on the Samford religion and speech faculties. The religion department gives an annual award in his name to an outstanding student. The couple became beloved surrogate parents to scores of missionary kids who attended Samford over the course of three decades. An endowed scholarship fund was established in their name to assist MKs at Samford.